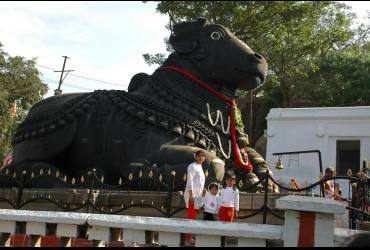 Dodda Basavana Gudi (the Nandhi Temple) is situated in Bull Temple Road, Basavanagudi, area of South Bangalore, part of the largest city of the Indian state of Karnataka. The Hindu temple is inside a park called Bugle Rock. The bull referred to is a sacred Hindu demi-god, known as Nandi; Nandi is a close devotee and attendant of Shiva. 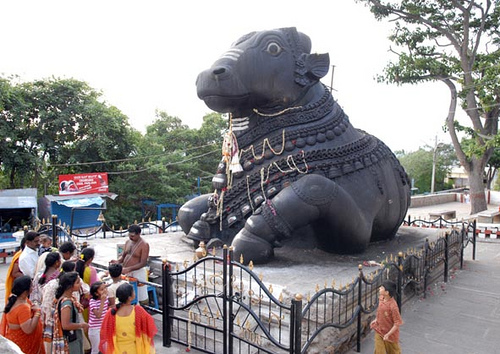 Dodda Basavana Gudi is said to be the biggest temple to Nandi in the world. The stone cult image of Nandi is continually covered with new layers of butter, benne in the local language of Kannada. There is a cult image of the elephant-headed Hindu deity son of shiva Ganesha close by. Every year on the last Monday and Tuesday of the Hindu month of Karthika Maasa a groundnut fair is held in the temple premises and groundnut is offered to the deity. This fair is known as 'Kadalekaayi Parishe' in local tongue. Groundnut sellers and devotees throng the place during Kadalekaayi Parishe.